A brief look into the future. It’s November 1, 2007. Last week, the second phase of the San Clemente Coastal Trail was completed. Not necessarily a new route, the old one was used since the town was founded in the ‘20s. The Trail evolved as a result of “rites of passage,” the rights of trains to move north and southward, versus the rights of citizens and visitors to cross the railroad tracks to reach the beach and ocean. It’s the result of a groundswell of citizen opposition to a concrete mini-freeway, which would have huddled alongside fenced tracks to form a corridor through San Clemente’s fragile beach shelf and bluffs. It’s the result of a local citizen’s panel creating a trail design addressing the safety issues, the environment, and concerns of railroad officials and citizen users. It’s the result of three activists and two City staffers diligently enlisting the aid of political figures and multi-government staffers to reach their goal. It’s a result of five million dollars in funding growing to ten million. It’s the result of tact, trust, and tenacity. The lavish Trail dedication, held November, 2006, under our typical, balmy, sunny sky. It was attended by dignitaries of many agencies: the California Public Utilities Commission, California Department of Recreation and Parks, California Coastal Commission, Metrolink and various railroad agencies, the Orange County Transit Authority and hundreds of local citizens. Of the latter, two, in particular, Kathryn Stovall-Dennis and John Dorey were honored, as were City staff members Jim Holloway, Community Development Director, and Jim Pechous, Senior Planner. It was on their shoulders that the “tale of the trail” rested for five years. The ceremony was the happy culmination of a long journey. Walking leisurely along the wide Trail of decomposed granite, sided by natural plantings, with resting benches conveniently placed, we begin the all-weather trail from North Beach to Califia, along the inland side of the tracks. There are 15 different spots along the tracks that people can cross under or over. Several mountain cyclists pass us and a few dogs, at leash length, pulling their handlers. Upon hearing the warning bell, we pause at the lowered gate at Diji Court. At El Portal, a train passes. We stride the steps over the rocks down to the sand. Returning to the trail, two senior citizens pump alongside us in their wheel chairs. At Mariposa Point, we use the stairs down to a new underpass and a few more short stairs to the beach. Approaching Linda Lane Park behind a young mother pushing a stroller, we’re pleased that the park has been extended seaward to encompass the Trail. A ramp and the remodeled underpass accommodate greater pedestrian traffic. Just north of the Marine Safety Building, at Corto Lane, we cross the trail over the tracks oceanward at the new “at grade” crossing. Lifeguards are changing shifts. Continuing on the seaward side behind the building along the current service road, we pass the busy beach crowds, the tot lot and begin jogging slowly behind Fisherman’s Restaurant. With decomposed granite and native planting themes mixing with the natural terrain south of the Pier Bowl area to Califia, the trail continues southward along the ocean side of the tracks under the T-Street overpass. We join a group of walkers as we traverse inland over the tracks at the new Boca Del Canon crossing. Cyclists, runners and surfboard carriers pass us. There’s another crossing at Lost Winds. The trail continues along the beach to Riviera, where we note its improved underpass running up to the street and down to the beach. At Montalvo, part of the enhanced walkway along the eight-foot train trestle veers off to the beach. We examine the four-ft. fence made up of almost invisible wire stands. The main trail continues to its terminus crossing at Califia. Happily refreshed from our almost three-mile venture, we stop at Schleppys for a latte. We’ll spend a few minutes here before starting on the State Park extension of the Trail’s beach access. According to Holloway and Pechous, there were two major parts to the saga of the Trail. The first is a story of a grass roots movement, full of unanticipated consequences and events; the second is a tale of David (San Clemente) and Goliath (the California Public Utility Commission). Beginning in the ‘60s, City staff had explored a coastal trail project, and by the ‘90s had received grants for five million dollars for a design. Upon learning about the project, a number of local citizens became vocal, troubled by their lack of input and the ugly, concrete, sea-walled road that was intended to run closely alongside the existing railroad tracks. They formed a group called “Derail the Trail, ” led by residents John and Stephanie Dorey, Kathryn Stovell-Dennis, Bill Hart, and Mark Cousineau. They staged an anti-trail campaign incorporating hundreds of front lawn signs, T-shirts, flyers, emails and community meetings, involving scores of San Clementeans protesting this “City surprise.” In January 1999, the City Council voted unanimously to “kill” the staff proposed trail project. The tracks caused the conflict between the trains right of way and the human right of way. Annually, 2,200,000 people desire beach and ocean access. Daily, more than 50 trains pass through the City in both directions. 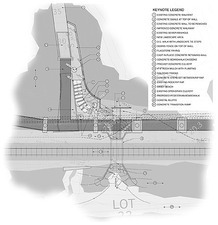 How can safe beach access and environmental preservation be accomplished, while insuring safety across access points and for pedestrian travel parallel to the railroad tracks? What about the constraints of rushing waves, ocean elevation at mean high tide, the elevation of the railroad tracks, sand flow, access for maintenance vehicles, rip rap strengthening, bluff stability, poor line of sight on the tracks and the flooding, puddles and mud brought on by rain? All of these concerns had to be addressed. To satisfy community uprisers and study the issues and problems of railroad safety and beach access, the Council appointed a group of stakeholders to create a new trail project the community could support. With Southern California Associated Governments (SCAGG) funding, a neutral facilitator was hired; the Rail Corridor Safety and Education Panel (RCSEP) was formed. Its intentionally diverse membership of stakeholders numbered 14. For nine months, Panel members deliberated problematic remedies. They conducted 14 general meetings and formed numerous sub-committees to study the issues. They sought the advice of experts, conducted several coastal walks, a lifeguard jeep tour and an inspection of the entire corridor via “hi-rail” vehicle. They studied maps, developed photo-boards of every section of the proposed trail route and used video documentation. Direct community input was solicited through a community forum and distribution of questionnaires and interviews with beach users. The Panel also looked at water quality and beach erosion. On January 19, 2000, the RCSEP recommendations in the form of a 50-page report complete with photographs and drawings of every section of the proposed trail identifying problems and proposed solutions was submitted to the City Council. “Now we had to go through the political process,” Holloway recalled. The Panel had selected Stovall-Dennis, John Dorey and Bob Noon to work in partnership with Holloway and Pechous, engineers and other consultants, on the future design and implementation of its recommendations. It was a case of former unintended adversaries uniting in a common cause, which resulted in a common trust. On the home front, a San Clemente Coastal Advisory Committee was created, new grants brought financial support to $10,000,000. An attempt by railroad organizations to add a second set of tracks through San Clemente met with a rebirth of DeRail the Trail in the form of DeRail the Rail; the attempt was squelched. Another grassroots effort, led by Michael Metcalf, insisted that Mariposa Point needed to be re-engineered to provide stairs and an underpass. This introduced another successful citizen intervention. Simultaneously, a process to introduce State legislation was pursued. Councilwoman Susan Ritschel sought political contacts; former grassroots DeRail the Trail advocate, now Councilwoman Stephanie Dorey rallied environmental activists to join the cause. Largely through the Councilwomen’s efforts, a coalition of supporters was formed to pressure the CPUC into approving the project. Assemblywoman Pat Bates, a Republican from Orange County, and Assemblywoman Sheila Kuehl, a Democrat from Santa Monica, introduced AB2434. The California Transportation Committee (CTA) approved the legislation, strongly encouraging the resolution of conflicting issues between the City and the CPUC. The threat of this possible bill being approved encouraged CPUC officials to negotiate in good faith. During this period, lobbyist Sandi McCubbin arranged for several of the SCUC commissioners to conduct site visits to personally view the proposed Coastal Trail route. Supervisor Tom Wilson was always on hand and Stovell-Dennis and Dorey, according to Holloway, “were very influential.” In the meantime, lengthy preparation and eventual presentation of the case for the Coastal Trail against the opposition of the CPUC was completed. In early 2004, a favorable settlement was agreed upon in the presence of an administrative law judge, which was approved by San Clemente’s City Council. Said Holloway, “Even with the settlement agreement between the City and CPUC completed, Caltrans (California Transit Authority) protested the settlement.” Pat Bates arranged a meeting between the staff and the head of Caltrans in Sacramento. With then Mayor Susan Ritschel leading the City contingent, Caltrans removed its objection to the project. The coast (no pun intended) was finally clear.